A weekly free bike coop where you can use mechanics’ tools and expertise to fix your bike? Free clinics where schoolkids or neighbors learn to maintain or build their own bikes from used parts? 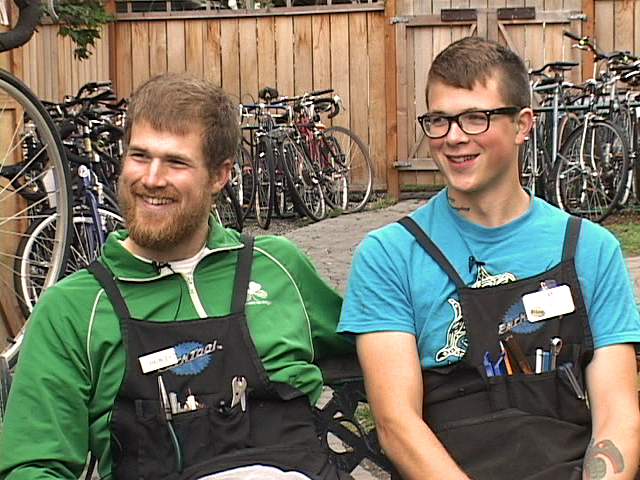 Chauncey and Dash Tudhope-Locklear make a living repairing bicycles, but volunteer projects support their mission of empowering “social change through bicycles.” With an eye to local food self-reliance, they even repair farmers’ bicycles for free. Episode 182. [www.ptrecyclery.com]. I was as affected as Janaia by the intention and work of these two young men. Chauncey and Dash–are there really only two of you?? The energy and commitment you offer to your community seem boundless! I find remarkable the awareness and selflessness you have developed so early in life. (I) get what you are doing. And I understand the challenges you are encountering. Please do not be swayed–even as I cannot imagine your being so. Our society as well as all others are in dire need of examples like yours. Ultimately, I believe that we will all have to come to such a recognition. THANK you. Right on, Chauncey and Dash; Good on ya! really inspiring! thanks, Janaia and robin!